Great bottling, big nose, full flavours. 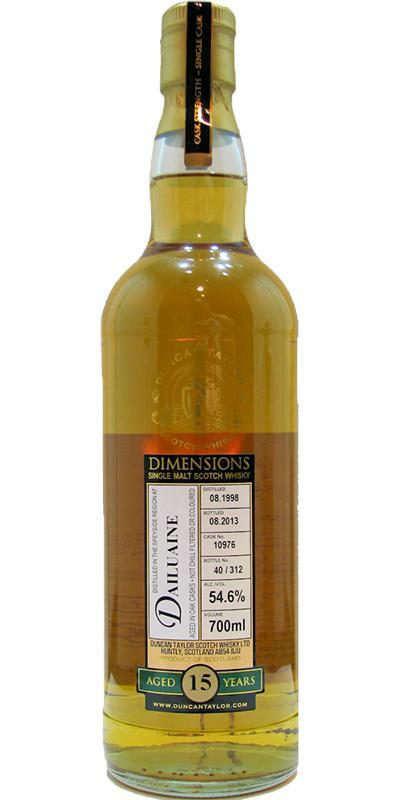 Head to head with the more sparkling 'Dailuaine 1992 DR Individual Cask Bottling' this one is much more creamy with a heavy ripe fruitiness to it. Also it's clearly less bitter in taste and finish (unless someone has switched the labels on my sample bottles). Quite astonishing, lots of sweet fruitiness, butter, grainy, cookie dough, a little nutty, vanilla, bitter oranges, peaches, mango's, pears, stewed apple and a bit of nutmeg and cinnamon. Oily, peach, pear and mango, a subtle grain note, quite spicy with pepper, nutmeg and a small amount of wood bitters. Short to medium in length: lingering peach and mango notes, a fair amount of pepper and a mild wood bitterness. Big fully flavoured nose. Caramel, floral, fruity and buttery. Red apples and vanilla, Quite waxy. This is an intens maturation. Beautiful stuff!! Oily and fatty. Sweet and light spiced on arrival! It certainly needs some water to restrain the beast. Again caramel, vanilla, dry and bittersweet. Vanilla and buttery. Like a creamy vanilla pie. Some smoke like from a fireplace at home. Bittersweet. Sharp, bitter, metallic, later sweet overripe fruit. With water softer, butter, peach. Beautiful dram. Fine mouthfeel but in my opinion a bit too sweet. pleasantly sweet fruity (especially apples and coconut), caramel, honey and butter. a little less sweet, but also apples, melon, grapefruit-bitter and a pepper. I found the nose to have a nice complexity, but the taste is not my thing. I do not like the bitter. However, the taste is rich in taste and makes it a mature whisky. A kind of blossom. Lavender? Floral and fruity. Sweet. Again the apples and pears and if we are still comparing, with this Dailuaine I smell some sweet fruits like raspberries, strawberries. The high ABV does come around the corner. Sharp, spicy. Pepper. Bitter. Medium long finish. Bitter. Stick to the tongue for a long time. Sweet, with a kind of wine like smell, little must smell. Furthermore, some smells like heather, honey and straw. After a while, a smell comes in that you can smell from those sweetened, sour peaches from Haribo, to stay in detail. Nice fresh acid with a sweet twist. There is something mineral in it. The body is medium. There is a fair amount of caramel, but that is quickly drowned out by the sour peaches. Short-medium length. A lot of sweets, caramel and some wood. It flattens out pretty faintly with a small influence of tannins. In the finish, the bourbon maturation is easy to find.